scamFRAUDalert see it necessary to issue this ALERT as this is becoming an escalating trend is Florida’s vacation industry. Scammers have targeted this particular group and are creating persuading websites with registered businesses and other fraudulent schemes to get you to sign up for a vacation package. They create names like Preferred Guest Resort, Prefered Guest Resort, Best Ever Vacations, 7-Night Exclusive Resort, blah blah blah. The results below are provided by Rebel.com. scamFRAUDalert see it fitting to issue this ALERT as job seekers have indicated that they have been contacted regarding mystery shopping opportunities. There is a Presence quality control usa in Idaho Falls, ID. It appears like their identity have been compromise as many other companies. 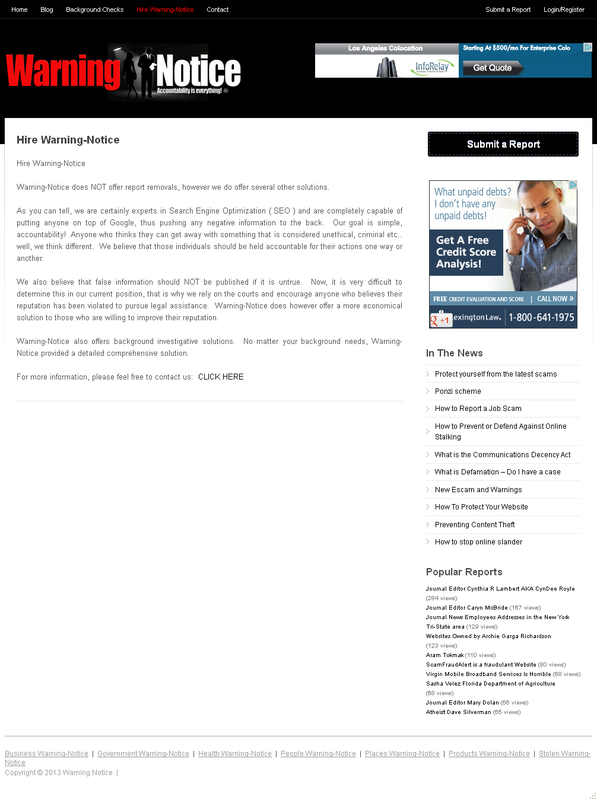 Elite Consulting Services USA now DBA Warning Notice ~ warning-notice.com came under our radar when we reported on Potential Predators ~ potentialpredators.com website. We later learned Potential Predators operators are also DBA WikiWarning.com . We have since discovered that the operators uses several aliases and affiliates to carry on his schemes of so-called Search Engines Optimization [SEO]. These schemes includes posting FALSE INFORMATION and personal information about anyone or manufacturing LIES and submitting these LIES to search engines. Creating websites which sole purpose is the publication of DISTORTIONS. These SEO practices are dangerous to the e-commerce and the global community. 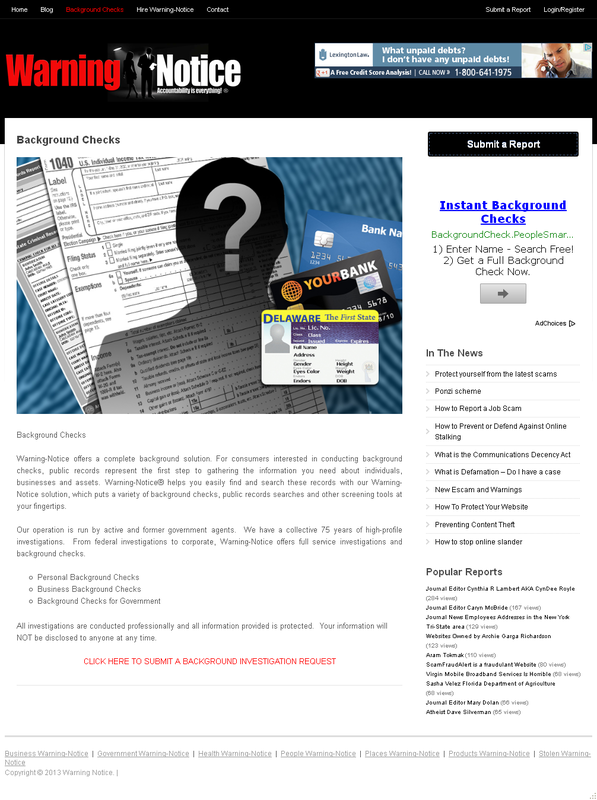 Take scamFRAUDalert for example, we reported on potential predators now PredatorsWatch.com as did other scam sites. Now we are targeted and having to DEAL with this SEO and background search service operation nonsense, his insanity and other nonsense that are so rampant online originating out of Miami, Florida and India. Some of these SEO practices reference below includes Ddos attacks and Lawsuits. THESE INDIVIDUALS REPRESENT A CLEAR AND PRESENT DANGER TO THE INTERNET COMMUNITY. Based on the number of complaints and actions taken by State Attorney Generals, scamFRAUDalert see it necessary to issue this ALERT as to the aggressive collection tactics of National Credit Solutions. If harass, please file a report with the Consumer Protection Bureau and the Better Business Bureau. Also, make sure to let us know. We are Search Engine Optimization (SEO) reseller firm with 30 + highly experience professionals based out of National Capital Region in India. We are providing affordable reseller SEO services and assure to give you white label reseller SEO services. We will strictly work as a Reseller oriented SEO outsourcing company and you can build your own SEO portfolio without even having a SEO experts or SEO team at your place. Our goals are very simple. We believe in Security, Choice, Quality and Speed and therefore you are assured of results that meet the highest quality standards. All of our practices are “White Hat Technique” and ethical and therefore you can be assured of results that get your client’s website the best placements. Please feel free to write me if you have any questions or need further information. Look forward to your response and work with you soon.